On the eve of the team's home opener, Ryan Straschnitzki is working hard in physiotherapy to adapt to the paralysis he suffered in the Humboldt Broncos bus crash, saying he's determined to do things for himself. 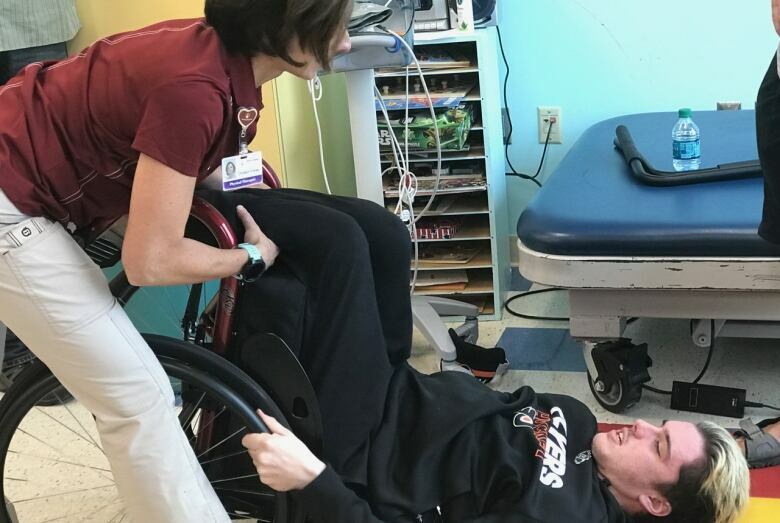 Ryan Straschnitzki sits upright with help on his hospital bed, his paralyzed long legs stretched out in front of him. He gingerly bends over double at the waist, the pain from his spinal surgery is still there. His therapist encourages him to use his arms to lift one ankle over the other, in order to pull on socks. "Oh, it's heavy," Ryan says as he picks up one limb with both hands. "Legs are heavy," replies his therapist. That was in May, a month after the Broncos team bus crash in Saskatchewan that killed 16, and injured Ryan and 12 more. 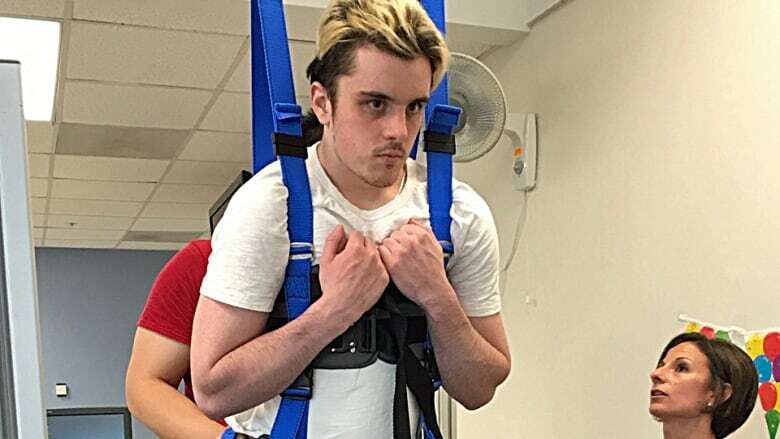 Ryan was thrown from the bus and likely landed head-first in a tuck, according to his surgeon, causing irreparable damage to his spinal cord high up in his back. From those first painful weeks to now, Ryan has gone from a hospital bed back to the gym, doing assisted push ups and pull ups. He's moved from a body sling to a wheelchair, and now he's been transferring himself to a car, a boat, even an ice hockey sledge, where he's working on his slapshot. "There's so much to work for," he says. "Keep a positive attitude. I know it sounds cliche and old, but it'll take you a long way. "I mean, it's only been five months and look where I am now — and that's all thanks to my attitude and the people around me." Many of Ryan's days now involve a 45-minute ride, usually alone in the back of an accessible van, to thrice-weekly physio sessions. Working with a physiotherapist, he's strengthening his shoulders and gaining back some of his core muscles, which are critical to his independence. He's had to relearn motor movements, for example, like hoisting himself up by his elbows in bed or using his arms in a windmill motion to roll over. Ryan Straschnitzki exercises with his phsyiotherapist, Christin Krey, with the goal of both building his muscle tone and learning to be more self-reliant. (Susan Ormiston/CBC)From a seated position he's mastered transferring from the wheelchair into a car seat that's 23 centimetres (9 inches) higher, a real challenge. He's reduced his morning wake-up routine to one-and-a-half hours from two, a notable improvement. "Just relying on myself to do things instead of asking people to do them for me, it feels good," he says. In May, the Shriners charity in Calgary offered Ryan a spot at the Shriners Hospital for Children in Philadelphia, fully paid for up to two months. The Straschnitzkis leapt at the chance, hoping they could get access to therapy more quickly than it might take in Alberta. They harboured a hope maybe Ryan could regain some movement in his legs. His Dad, Tom, went with him. Tom Straschnitzki is a hockey nut, easily recalling players and teams going back decades. The family home in Airdrie is decorated with hockey memorabilia and pictures of his four kids' sports successes. 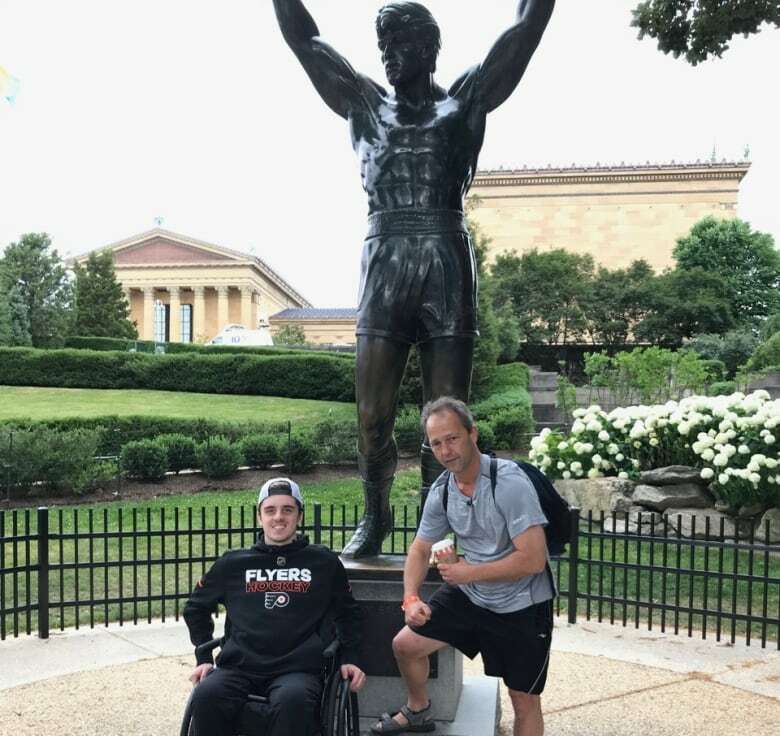 Ryan and his father Tom at the top of the 'Rocky Steps' in Philadelphia, which actor Sylvestor Stallone famously raced up in his boxing film. Ryan was in the city for treatment. (Susan Ormiston/CBC)He's been Ryan's chief motivator and life coach. "I just remember seeing him [after the accident] and he was alive, so we went from there," Tom says, then he pauses. "What gets me is, just looking at him, what he used to be able to do [before the accident] to what he can't do now. Kind of hits me on that one. But, I just look forward and say let's work a different corner. Work a different path. We can get through it." And they are. Physicians and therapists at the Shriners hospital described Ryan as a highly motivated athlete, intent on pushing them and himself to master more skills faster. "We're looking primarily for the health benefits of maintaining a range of motion and keeping the legs and the joints supple, so that should there be a cure down the road, his body will be ready for it," says his physiotherapist Christin Krey. She and Ryan have forged a close bond. Asked 'what do you wish for him,' her eyes start to water. "Now I'm going to get emotional," she catches herself. "For all of my kids [patients], I wish for some sort of return [of movement from paralysis]. My heart's side of me wants all of them to get better. But my knowledge knows that's not always possible, so I just hope for him to succeed in everything he does." Ryan hasn't been able to go home to his family's house in Airdrie, Alta., since April. The entire family of six has decamped to a local hotel while their house is renovated to make it accessible. It's already been two months and will stretch out at least another three. Uno is a favourite after dinner game in the 'hotel home' with mom Michelle and sister Jayden. 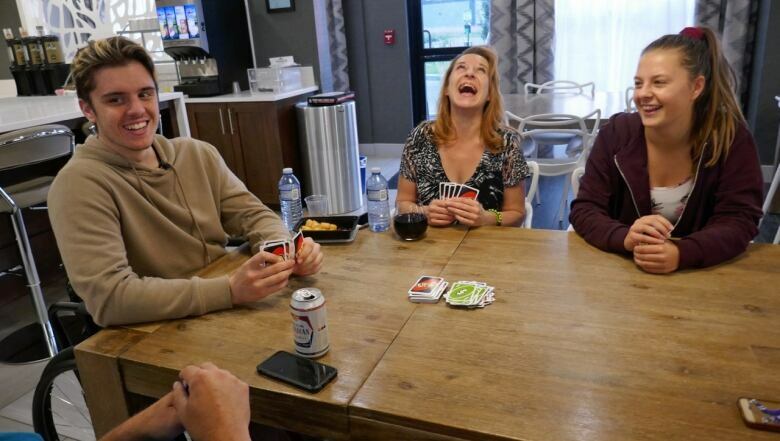 (Susan Ormiston/CBC)Michelle Straschnitzki is living with her four kids, aged 19 to six, in the Wingate hotel, which they affectionately call the Strazgate; the owner has donated rooms for as long as the family needs them. "It's really hard, essentially condensing six lives into three rooms and still trying to manage day-to-day activities," Michelle says. "It's awkward, but we're getting there." She adds that the impact of the accident is really settling in now. "I think just the enormity of what he's facing is hitting him sometimes. Most of his friends are gone back to school and hockey, and he's here, he feels a little bit left behind." On Sept. 12 the new Broncos team plays its home opener against the Nipawin Hawks, the team they were headed to play when the bus crashed. Only two of the former players are back; there is a roster of new players and a new coach. Initially the Straschnitzkis were keen to travel to the game in Humboldt, but Ryan has had a change of heart. "I love the Broncos, I wish them all the best of luck and everything during the season," he says. "At the same time, I don't want to watch the team that I should be playing on right now. So I just don't think I can go watch." Too hard? "I think so, yeah." 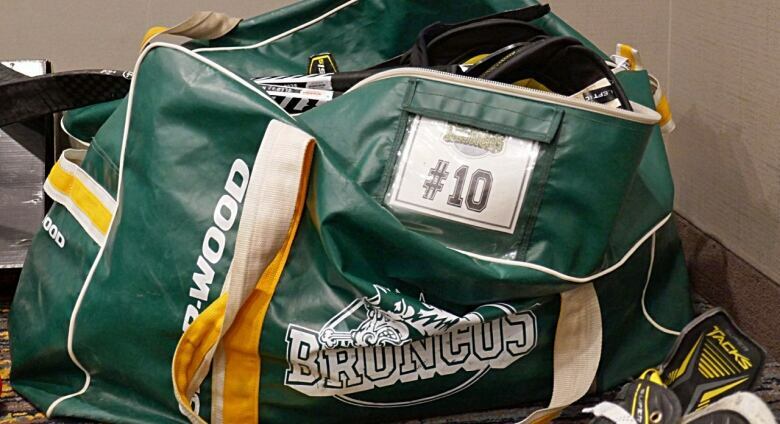 The hockey bag Ryan had with him on the team bus when it crashed still holds his skates. But he has started using some of his Broncos equipment for sledge hockey. 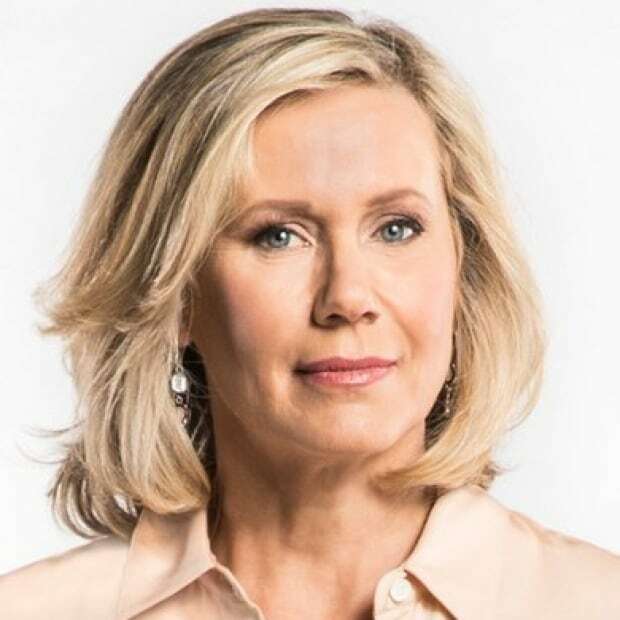 (Susan Ormiston/CBC)Ryan reveals he's not angry about the accident, he's more accepting now, but that doesn't mean the memories are any less dulled. "I usually think about it every day," he says, reflecting on the Broncos teammates he lost. "It's never going to leave my mind, to be honest." And at the end of August, as his friends went back to hockey camp or school, Ryan says he felt a yawning absence of the purpose which had driven him every fall. But he's dealing with it. "I think people are going on with their lives now, and you've got to kind of figure out what to do now because, I mean, everyone's lives have been changed." Ryan and girlfriend Erika Burns enjoy the August long weekend on a boat in Waskesiu, Sask. Ryan was motivated to learn how to transfer himself into a boat from a dock to make this getaway possible, one of his first times away from hospitals and his family since the April crash. As summer fades into fall, Ryan is transitioning. His girlfriend, Erika Burns, has moved to Airdrie from Saskatchewan to live with the family. He's excited about that. The two teenagers met only two months before the accident, introduced through a Broncos teammate, and now they're embarking on a relationship neither could ever have imagined. And his hockey bag, retrieved from the crash, still holds his skates and pads. But he now uses his green-and-gold Broncos helmet and gloves for sledge hockey practice, where he says he's the happiest — back on the ice. "Brings back a bunch of memories, obviously," he says. "It's the same game, just playing a different way. It's a lot to learn." The medical prognosis for Ryan's type of injury suggests he may not regain movement in his legs, but Ryan has not given up that prospect. "It's always good to have in the back of your mind. You work towards that, sort of trying to train your body to hopefully walk again. But, I mean, if I don't — it's not the end of the world."